Bidgely continues to advance its award-winning HomeBeat platform with the launch of a new comprehensive full-bill disaggregation solution, which provides total home energy itemization for utility customers. For the first time, customers receive fully itemized breakdowns of both their electricity and gas usage in one bill, thereby creating greater insights for customers and new engagement opportunities for utilities. Bidgely’s new full-bill itemization leverages the company’s industry-leading disaggregation algorithms to identify the majority of home energy consumption and supplements that with a rule-based model, localized for different geographies, to provide a 100 percent breakdown of energy consumption. Full-bill disaggregation works with any type of meter, including monthly read data, and the solution’s accuracy self-improves as customer engagement increases over time. Three leading utilities in Europe and three others in North America are offering the solution to customers over the next few months. With full-bill disaggregation, their customers benefit from visibility into gas appliances in the home alongside electric ones. In addition, electric load itemization has expanded to include lighting and entertainment. To read the Bidgely White Paper about full-bill disaggregation, please visit: http://bit.ly/2aAqS73. 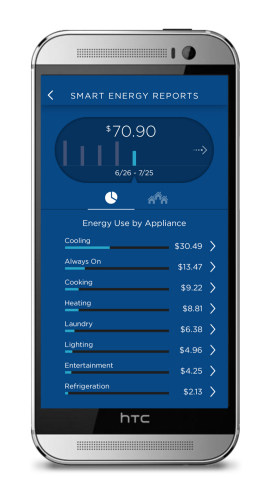 Bidgely is transforming the way utility customers use energy. By combining the power of SaaS-based analytics with consumer-friendly Web and mobile applications, Bidgely provides personalized and actionable insights that help customers save energy and enable utilities to build enduring customer relationships. The company works with utilities serving residential customers worldwide. For more information, please visit www.bidgely.com or the Bidgely blog at bidgely.com/blog. Bidgely, HomeBeat and the Bidgely logo are trademarks of Bidgely in the U.S.